My choice this week is Key West Diary by Conch Scooter, who never fails to deliver observations and information that is interesting. A huge plus is the photographs that accompany his postings, most of which he takes himself while out and about in South Florida on his Triumph Bonneville. I missed naming a Key West Blog of the Week last Friday, for which I am truly sorry. New routines take time to become established. 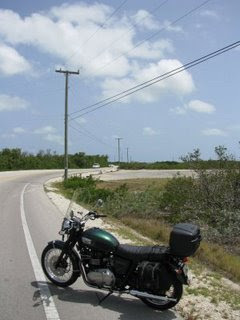 Riding my Triumph Bonneville and photographing the Florida Keys one island at a time. So for consistency and quality, I hereby declare Key West Diary Key West Blog of the Week for the first week in July. This is not the real Key West. You are just another uneducated political bigot from the yankee trash North with a second class citizens complex parroting the same old tired Citizen’s Voice garbage. Do us a favor and go back home. When do you have time to be a writer with all those sandwiches to be delivered to the tourists? I’ll bet you are one of those Gomers delivering sandwiches on your mufflerless motor-scooter that annoy the Hell out of us in “The Real Key West”. Too chicken to leave your name. Obviously, you don't even know him which is obvious by your ignorant post. Golly gee willikins. Never get this sort of comment on my dreary little blog, so kindly reviewed here. Life really is stressful in "paradise" as amply illustrated! Cheers, Michael. What kind of sandwiches? I might want to order one. Do you deliver to Boca Chica Key? :) I like conchscooter's postings. It's a refreshing look at some of the places I ride by on my V-Star everyday. Hey Dad, Can you bring me a pastrami on marbled rye on your scooter? We're all out of pastrami (only cheeseburger), Pepsi, cheeps. And we're out of rye. And I don't have a scooter.